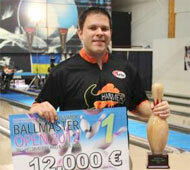 16th January, Helsinki: PBA pro and three-time World Champion, Bill O'Neill defeated Mike Fagan, 236-224 in an all-American final to become the first non-Finn to win the 42nd Brunswick Ballmaster Open since 1996 at Tali Bowling Center. O'Niell, who finished fourth in the 8-games Final Step 1 with 1815, won six of the eight matches contested in the Round-Robin Final Step 2 to advance into the finals as top seed with 3576 pinfalls. Defending champion and WBT Final champion, Mika Koivuniemi of Finland finished second with 3584 from five wins and a draw to make the semi-finals while Final Step 1 leader and PBA champion, Mike Fagan took third spot with 3520 from six wins and a draw. Last year's Qatar Open and Emir Cup champion, Dominic Barrett of England squeezed into the semi-finals in fourth spot 3557 from five wins. Pasi Uotila of Finland missed the cut by finishing fifth with 3455. Third-seed Mike Fagan edged Barrett, 232-214 in the first semi-final match before denying Koivuniemi his third consecutive Ballmaster title in the second semi with a 251-233 victory to earn a crack at the title. But Fagan's fine run came to an end after going down to O'Neill in the final. O'Neill pocketed €12,000 (approx. US$15,280) and earned 50 World Bowling Tour points as champion. Fagan received €8,000 (approx. US$10,190) and Koivuniemi settled for €4,000 (approx. US$5,095). Krista Pöllänen of Finland, who finished 40th position in the Final Step 1, was the best women finisher to win the opening stop of the European Bowling Tour 2012 and World Bowling Tour 2012 ahead of Sandra Andersson of Sweden in second. The second and third stop of the WBT 2012 will be the USBC Masters (January 22 - 29) and the inaugural WTBA International Open (Jan. 28 - Feb. 5) at Strike Zone Bowling Center, Sunset Station Hotel & Casino, Henderson, Nevada. Photos courtesy of Tali Bowling Center.